View topic - [Coding competition 2019] Gotris by Kusfo, ManuTrigger, Davidian - Forums - SMS Power! Gotris is the impossible mix of the ancient game of GO and the mighty Tetris. Surround pieces from one colour with the ones of the other colour in order to clear them and earn points! 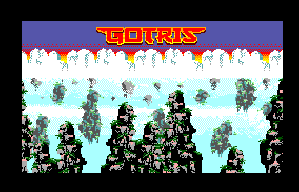 Gotris is based in a prototype game that I made with PyGame back in 2006-2007. I never polished it, but I had the concept in the back of my mind. As I spent a couple of weeks on medical leave at the beginning of March, I decided to try to port the idea to the SMS. It has been programmed on a hurry, recycling some code from other projects, and it can be improved a lot, but it's playable. It has used devkitSMS by Sverx. 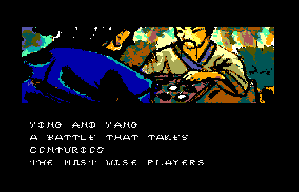 Graphics have been done by ManuTrigger, and music has to be provided by Davidian. First version has placeholder music from another project. It seems to hang when removing stones some of the time, I had to reset every game I played when this happened. It also seems a bit inconsistent at detecting surrounded stones, particularly for groups larger than 2. The auto-repeat on rotation seems to kick in too easily, I'd often rotate twice with one button press - I think it'd be better to either remove the repeat or add a longer initial delay before it happens. I have detected both bugs you're mentioning, plus another one when the screen is almost full. I'm working on finding the cause using the Emulicious debugger. And I'll take note of the autorepeat rotation! Very intersting and novel concept. I don't think I've grasped it fully yet. Need to play more. Game looks and sounds great, btw. Thanks for your kind words Kagesan! I just uploaded a new version 0.6 that fixes couple of bugs (actually one little bug was causing 3 o 4 different errors), adds pause and improves control. I just uploaded a new version 0.6. Hi - nice idea to mix the 2x game concepts so this isn't *another* tetris clone. Great art esp. 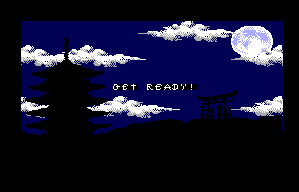 the title screen - really like the parallax scrolling. Thanks for including the source code - that's always helpful to get an insight how the game was built! If you were looking to add any features then I think an option to quit out while the game is playing could be good. Thanks for your thoughts! I suppose you'll find rotation controls better in the new version, but let me know if you feel they're still unresponsive! About the quit option, I suppose that you mean having a quit option when pausing? PD: Btw, No real knowledge of GO is necessary. Pieces disappear when they are surrounded by pieces of the contrary color (for example, you can make dissapear a groupof six white pieces if the group is surrounded by black pieces in al four side. I suppose you'll find rotation controls better in the new version, but let me know if you feel they're still unresponsive! Uploaded a video and one thing Kusfo, at the end of the video, no more pieces falling down, is it a bug? Well, button 1 and 2 do different actions. one rotates clockwise and the other one counterclockwise :-P. But maybe it would be more useful to have the option, and keep only one rotation sense. Hi law81! Yes, there's some kind of bug sometimes when pieces are falling (you can see one floating in the video). I've to take a look at it. Btw, I've final music in the game, I'll upload the new version soon (I'm trying to fix the bug). I'll try to implement the pause options before end of the contest. Btw, New version!!! Now with final O.S.T by Davidian and some minor tweaks around! I've still to catch the bug that law81 was speaking about. New version! Bug solved and some playability tweaks done! I am glad this is getting updated, I am a sucker for this type of game. Right now it is seems like the Left<>Right controls reacts too slowly, that would be my main feedback. I've been tinkering with fall, movement and rotation speeds (they increase as you earn points), and maybe I've gone too far for the begining, hahaha. I'll try to fix it back! IHMO rotation and movement should always be super reactive and not related to the falling speed. In previous versions, those speeds were not changing, but once the pieces start to fall really fast, you need a big horizontal speed in order to be able to place the pieces in the right place. And this big horizontal speed is annoying at the beginning when the fall speed is really slow. The problem is not even only the repeat speed but the fact that it react really slowly to a press. (1) A first L/R press should make the block move immediately (current or next frame). Right now the movement is largely delayed. (2) Holding on L/R should start repeat the moving the block after an initial delay. As per rule (1) the block moves immeditely in the initial press, then you start counting and start repeating the movement after a certain time. Just like keyboard interaction in any OS, you have a initial repeat-delay (time between first movement and second movement, e.g. maybe ~0.25 seconds) and then a repeat-rate (time between one movement and the next, once the repeat-delay is passed, maybe 2-3 frames). (3) You may decide to reduce the repeat-delay as the game become faster. Reducing the repeat-rate as the game become faster will be a little more confusing for the player. The repeat-delay cannot be too small to prevent accidental multiple-move. (4) Pressing L/R _before_ the new piece appear (from the point the _previous_ piece lands) should start accumulating into a timer which will be used to subtract from the repeat-delay. In other words, you can skip the repeat-delay by holding L/R earlier, and then your movement speed is bounded by the repeat-rate only. If L/R is released before the new piece appear the repeat-delay is restored. (5) N individual L/R presses in a given direction should always lead to N movements of the block. Right now many are missed. Individual presses should override any timer. With repeat-rate between 3 frames and (4) to cancel repeat-delay + initial move as the piece appear, it woudl takes only 15 frames (0.25 seconds) to reach any side of the board from the center +/- correction.